Leading mobile phones retailer, Axiom Telecom, has introduced a new Lucky Dip promotion offering shoppers over Dh1 million ($0.27 million) in prizes. 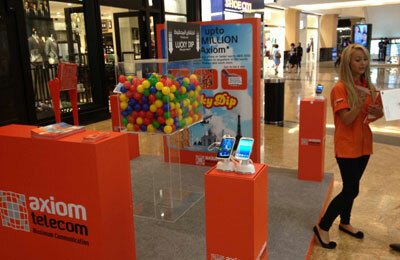 Each purchase over Dh500 at an Axiom Telecom store in UAE grants customers the chance to pick a ball from the Lucky Dip box. Prizes up for grabs include plane tickets, gold coins, and mobile phones. This is a part of a wider road-show, which has already made a stop at the Mall of the Emirates and is set to appear at Deira City Center Mall, a statement from Axiom said. The road-show will also feature a raffle to win a Samsung Galaxy Tab 2. With 2,000 employees, Axiom Telecom is the Middle East’s largest mobile retailer, currently boasting a portfolio of 575 retail points and reaches over 3,742 points of sale across the region.